On Wednesday, parliamentary affairs minister Ananth Kumar said lawmakers of the ruling alliance at the centre will give up their salaries and other allowances for the 23 days that parliament did not function. New Delhi: The second phase of the budget session saw very few business that were transacted in the two houses. Today, on the last day, it was no different. The ruling party had called for a party parliamentary meeting today to discuss various issues. 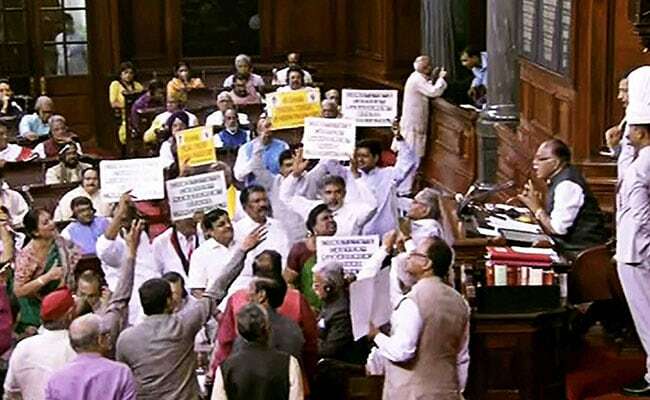 Since 5 March, the parliament has been disrupted by opposition parties demanding special status for Andhra Pradesh, formation of Cauvery Management Board, centre's response on the massive bank frauds and various other issues. Both houses were repeatedly adjourned everyday minutes after the session began. In all, Lok Sabha has lost approximately 115 Hours and Rajya Sabha has lost approximately 111 Hours. Money lost on wasted sessions is pegged at approximately Rs 169.5 crore. On Wednesday, parliamentary affairs minister Ananth Kumar said lawmakers of the ruling alliance at the centre will give up their salaries and other allowances for the 23 days that parliament did not function. Congress leaders are now protesting at the Gandhi statue on issues of farmer distress, atrocities on Dalits, special status for Andhra Pradesh, fuel prices, etc. Upset over the way house has been handled, for the first time, the Congress party leaders - Sonia Gandhi, Mallikarjun Kharge and others - have stayed away from the Lok Sabha Speaker's customary tea session in her chambers. Speaker Sumitra Mahajan adjourns Lok Sabha indefinitely. It functioned for less than 15 minutes on the last day of the session. 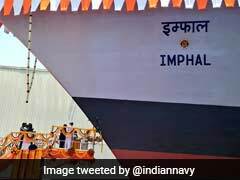 PM Modi traced the history of BJP and said it has been a long journey for the party and that it has now reached new heights. "We are for discussion on any issue in parliament be it banking scam, etc and go and tell the people and communicate to the people about the congress's decision to obstruct parliament," PM Modi told ministers attending the parliamentary meet. At the BJP parliamentary meet, Prime Minister Narendra Modi told ministers, "You need to go to the people and tell them that the congress is directionless and without any agenda and is not interested in any discussion." Congress lawmakers from Punjab protesting in the parliament premises demanding farm loan waiver. 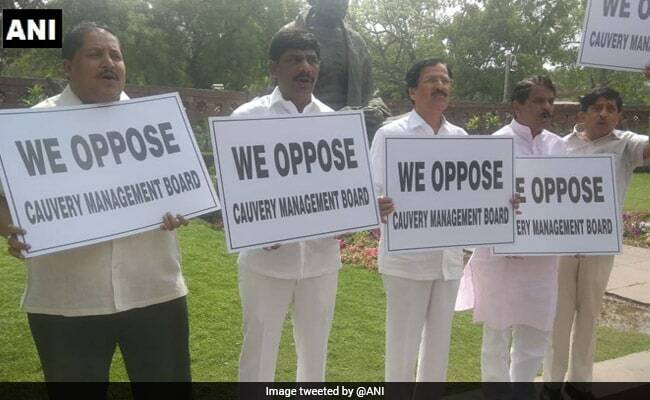 Congress lawmakers from Karnataka with placards outside parliament. They are protesting against the establishment of Cauvery Management Board. 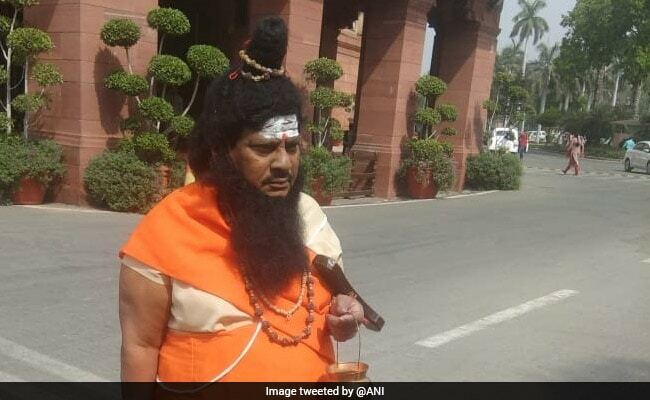 Protesting TDP lawmaker Naramalli Sivaprasad, dressed as Sage Vishvamitra, demand special status for Andhra Pradesh. 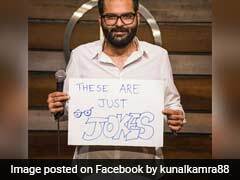 He had dressed up as a woman, a washerman and a school boy in the past. "Shraap for Modi if he doesn't listen to our demands!" said Mr Sivaprasad. BJP parliamentary meet begins in Delhi. 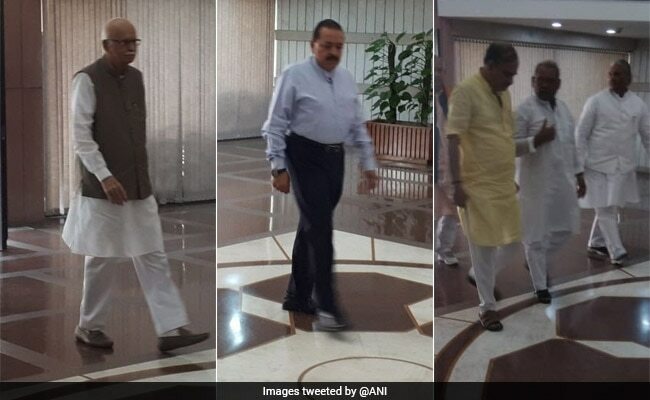 Senior BJP Leader LK Advani, Jitendra Singh and Parliamentary Affairs Minister Ananth Kumar arrive for BJP parliamentary party meeting in Delhi. Prime Minister Narendra Modi and Home Minister Rajnath Singh arrive for BJP Parliamentary Party Meeting.